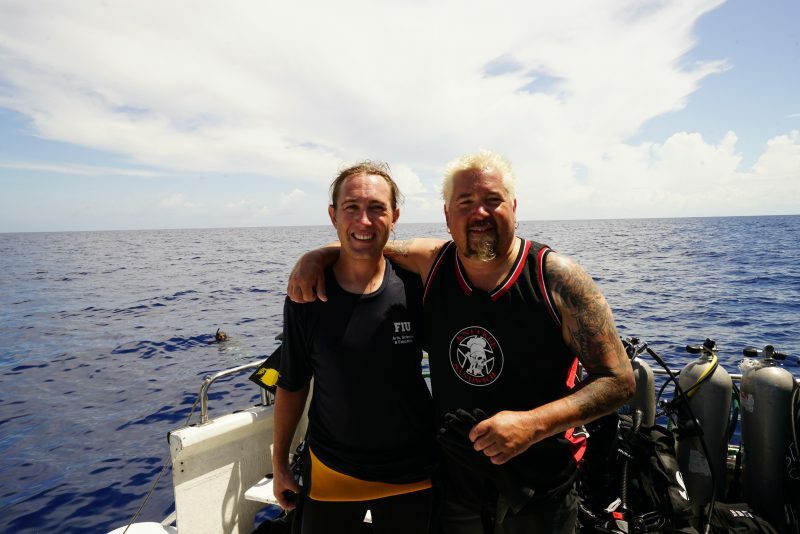 Mark Bond’s free dive with Guy Fieri and a dozen sharks will be revealed when “Guy Fieri’s Feeding Frenzy” airs at 8 p.m., Tues., July 24 on Discovery Channel. FIU Marine Scientist Mark Bond (left) goes free diving in a shark feeding frenzy for Discovery Channel’s Shark Week. Bond, an FIU marine scientist, recently joined the celebrity restauranteur in the Bahamas. Fieri visited the chain of islands to try local cuisine and learn about sharks and what’s on their menu as well. In the episode, which airs as part of Discovery’s “Shark Week,” Bond talks about what sharks eat and the mechanics of how they eat. That’s a lot of culinary ground to cover since different shark species have different appetites and feed differently. They also created a shark feeding frenzy using chumsicle, shark-attracting bait, to see how sharks feed in large numbers. The Bahamas’ warm waters are home to different species of sharks, including bull, Caribbean reef, hammerhead, lemon, tiger and oceanic whitetip. Bond, a research associate in the Marine Sciences Program, has conducted research on the distribution, abundance and behavior of sharks and rays in the Bahamas, Belize, Fiji, Madagascar and South Africa. He was part of an international effort to successfully add four shark species and nine mobula rays to the Convention on International Trade in Endangered Species of Wild Fauna and Flora (CITES) list of protected species in 2016. CITES is an international agreement between governments which aims to ensure international trade of wild animals and plants does not threaten their survival.